Steampunk, cyberpunk, and the musical style called punk all feature the theme of rebellion and the fierce spirit of the people working toward change and understanding in a setting defined by the word’s first syllable or two. So steampunk is, to me, rebellion in the time period when steam was the main technology. What is your favorite thing about steampunk or writing about steampunk? I love researching history and then diverging creatively from the history I’ve researched. What is your favorite steampunk accessory? What turned you on to steampunk? Cyberpunk ironically got me curious about steampunk because I love history and rebellion and began reading the works of Gibson recently. Steampunk, in my mind, is essentially science fiction in the Victorian/Edwardian era. Do you have any upcoming Steampunk stories you can tell us about? WEATHER WITCH is the debut steampunk novel in my YA steampunk series through St. Martin’s Press. It releases June 25, 2013 and is set in the 1840s on America’s east coast. My main female character is Jordan Astraea, a girl who is accused of something horrible the night of a grand birthday party. I integrate paranormal elements in the story as well as romantic elements. I’ll also be writing at least one freebie short story for readers in advance of its release, but right now I’m trying to decide which short story to pursue first. Who is your favorite character of all from one of your Steampunk stories? Oh, if I told you that, readers of WEATHER WITCH would think I’m crazy because, as I’m currently revising the second novel, STORMBRINGER, one of my characters has evolved into someone I truly adore. What’s the hardest thing about creating a Steampunk universe? Balancing the history of the period with the drama and fun that comes from writing fiction. What’s the easiest thing about creating a Steampunk universe? Falling into research and just reading and absorbing and brainstorming the possibilities. What does steampunk allow you to do as a writer that no other genres can? I honestly don’t know. I’d like to think a truly clever and creative author could work with essentially no restriction in any genre (except non-fiction). What are the challenges and advantages to writing a steampunk story? Finding and maintaining a balance between history and divergent fiction are equally challenges and advantages. How much research does it take and how much imagination? Learn more about the lovely Shannon Delany on her website. Enjoyed your interview. Looking forward to your new book. Great interview. 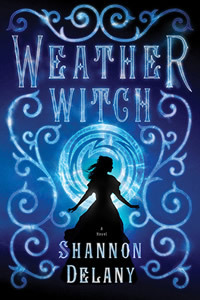 I’m excited to read Weather Witch, I’ll be watching for it’s release.